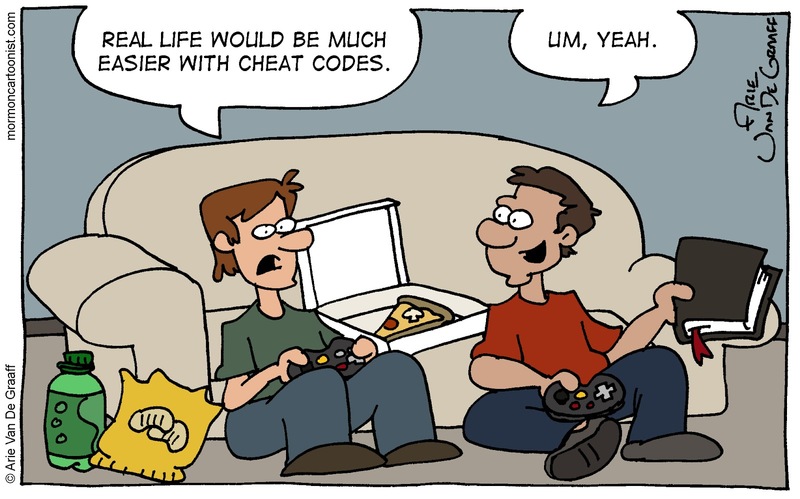 For those of you not familiar with the term, "cheat codes" are the collection of instructions spelling out what a gamer must do to overcome obstacles and navigate mazes in order to complete a video game. Some gamers reject cheat codes out of hand and would rather figure out everything on their own, but the majority of folks playing video games, I suspect, have no problem searching out a cheat code from time to time. *The scriptures. I'm talking about the scriptures. 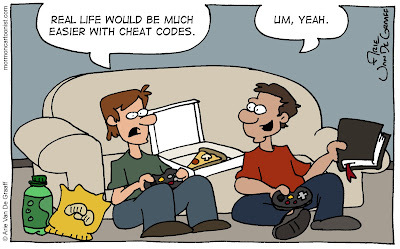 A more pure and correct definition is that a cheat code is a code applied to a game that changes the game's behavior. It is called a "cheat code" because the code is traditionally used to gain an advantage in the game that the game itself does not naturally provide. In that sense, the scriptures aren't a cheat code because they're a completely intended part of gameplay. They change our behavior, rather than the behavior or nature of the game (even if they do affect the outcome or ending of it). They do enhance the experience in unexpected ways, though. Suddenly my joke works a little less well. This is what happens when a guy whose video game expertise ended with the Super Nintendo twenty years ago! What you described sounds more like what I'd call a walkthrough.